The Self-study Pack includes the Student's Book with Answers and Audio CD. The Student's Book with Answers contains practice material for Paper 1 (Reading and Writing) and Paper 2 (Listening), along with attractive colour visual material to enable thorough preparation for Paper 3 (Speaking). 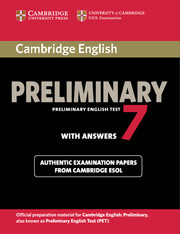 It also contains a comprehensive section of answers and recording scripts, making it suitable for self-study. The Audio CD contains the listening material for Paper 2.